Excess skin on your neck is an unsightly reality for many people. This can manifest itself in the form of a double chin or those ugly lines that run horizontally from one side of your neck to the other. These wrinkles can be the result of the build-up of fat or the loosening of skin on your neck. The good news is that with exercise, you can minimize or even eliminate these lines. This neck tightening exercise is designed to help smooth and tone the skin on your neck by stretching it and stimulating blood flow. 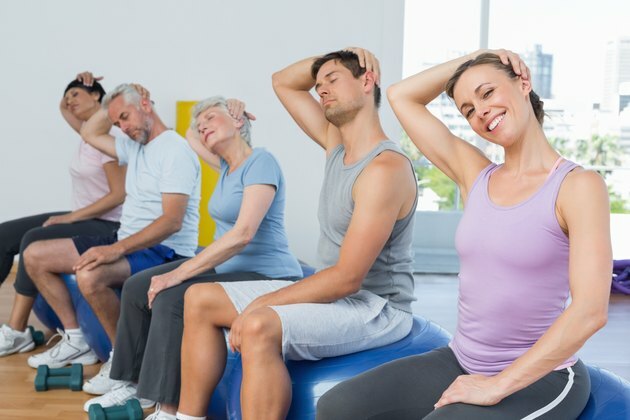 The website FitnessHealthZone.com recommends that you begin by sitting straight in a comfortable chair with your head angled back and your eyes looking at the ceiling to help stretch the skin of your neck. Lift your lower lip up and over your top lip as far as it will go while keeping your mouth closed. Hold this stretch for about 10 seconds and then relax and repeat 10 times, according to the website. The tongue press exercise can be performed while either seated or standing. Similar to the exercise listed above, it begins by tilting your head back so you are looking at the ceiling. Hold this position and press your tongue firmly on the roof of your mouth and notice the muscles in the front of your neck tightening. While holding your tongue in place, lower your chin toward your neck. The website ShapeYourFace.com notes that if this exercise is performed correctly, you will feel the muscles along the front of your neck and under your chin tighten. This exercise should be performed for the number of repetitions recommended by your doctor or therapist. This exercise is performed by sitting comfortably in a chair and tilting your head back until you are looking at the ceiling. Pucker your lips in a kissing motion and extend them outward as if you were trying to touch them to the ceiling. Hold this position for several seconds and then relax and tilt your head forward to the starting position. The facial exercise page at Dermaxime.com recommends that you perform five repetitions of this exercise every day for a month and then three times weekly.